Part Day Preschool is designed to positively promote the four areas of child development, social/emotional physical cognitive and language, through exploration, experience and fun. The Part Day Preschool year begins in September and ends in June. The school out days, holidays, and timeline which mirror the West Point Elementary/Middle School Calendar. The Program is designed for families that do not need full time care but would like their children to be enrolled in a child care setting outside of the home. This care allows social and emotional development for children while with other children of the same age range. Care is provided by an Army CYS Child Development Center that is nationally accredited. 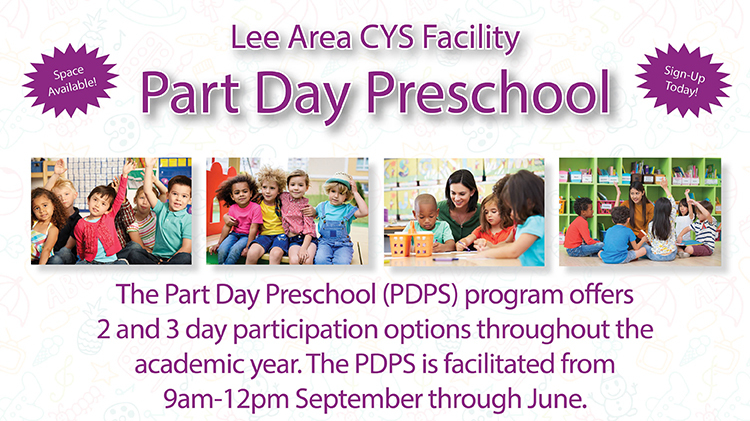 Part Day Preschool is a kindergarten readiness program and is a viable option for pre-k. Part Day Preschool is offered from the hours of 9am-12pm with the option of 2 days a week or 3 days a week.